We left the city center and went to the east about fifteen kilometers for our last stop of the day. The dirt in this part of Corsica is grainy and sandy granite. 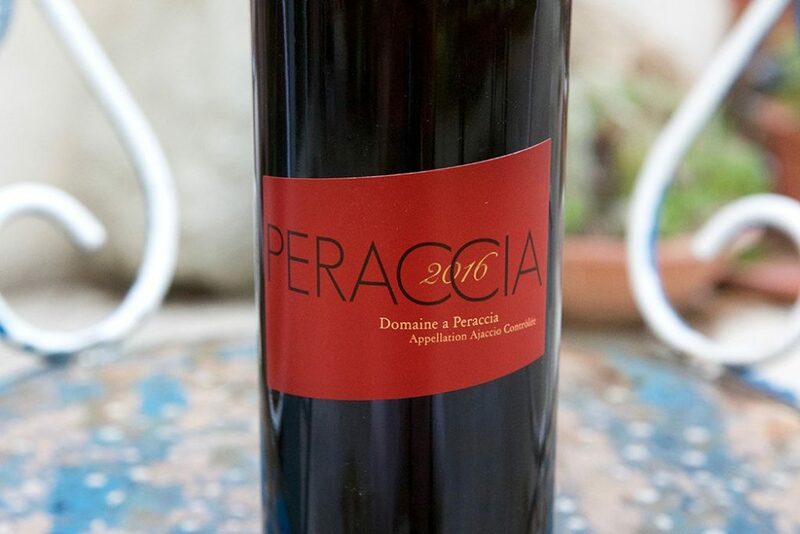 Our visit was with Laurent Costa, a bear of a man and the owner and vigneron of Domaine A Peraccia. Just as fast as he came in he went back into the winery and yelled back at Manu about which samples he wanted sent to the lab. The samples were out of the tanks within five minutes, labeled up and in Manu’s hands. We went to his tiny tasting bar set in the middle of his tasting room, newly adorned with wood panels and trim, and it felt like an alpine trinket shop in a national park. He grabbed the most recently bottled 2016 reds and the one 2017 white, pulled the corks, slammed a few glasses down on the table and stared at me with his big Disney cartoon-like smile. Like an old cowboy pouring whiskey, he hit the bottle on the lip of the glass and poured our first tastes of his Vermentino white wine. Last year, I thought the wines were a little too big and ripe; the vintages had been the 2015 for red and 2016 for white, yet they were both also somehow elegant. I wasn’t really into them then, but this 2017 white was very different. Despite the heat of the vintage, this had more tension, freshness and lift than his 2016, a cooler vintage. I really liked it, and not just a little bit. Laurent began to cut into some Niulincu, a local Corsican cheese that was on the table. When aged, this rustic cheese made with sheep and/or goat milk becomes a bit grainy but has a good salty flavor. He cut some more and looked at me to try a piece. I resisted as long as I could so I could taste through the wines without changing my palate with the cheese. The first red was good, very good. A 2016 made of pure Sciacarello, it was deep and lithe, brightly toned, fresh and charming. I was surprised at how different it tasted from last year’s wine. Laurent stared at me again, his nostrils flared to take in as much air as they could, “Tu aimes ça, Ted?” This time his tone was a little softer and his head tilted up so he could see me better through his glasses. I smiled and said I did. He poured wine three, his prestige cuvee, and his eyes grew even bigger and more curious. “It’s good. I like it a lot,” I said. It was a very good wine, more complex than the first and one of the top reds I would taste on the trip. Laurent broke his façade and quietly asked me if I was seriously interested in his wines. I jokingly told him to let me think about it. It was true though; I had to process my reaction this year compared to last and ask Manu to help me understand what was happening with Laurent and where he was going with his style. I asked Laurent for a couple of sample bottles to retaste them more slowly to see if what I tasted was as good as I thought. He happily obliged, bid us farewell and charged back into the winery. We jumped into the car and began our journey back toward Propriano. I told Manu the wines surprised me and that last year they weren’t my thing. I didn’t ask Manu much before this visit with Laurent because I hadn’t loved the wines last year, but after our tasting I needed to know more. Laurent is ex-military—no surprise there. 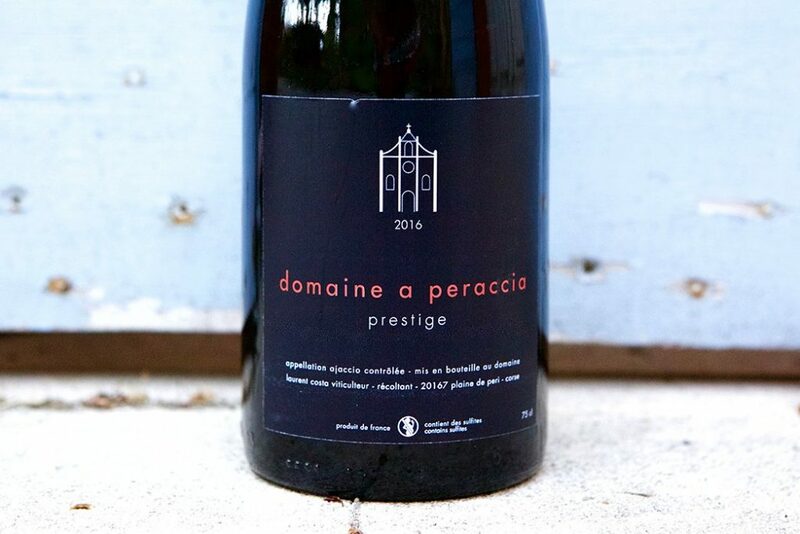 He took over his domaine about ten years ago and has a very successful business selling his wines direct in Corsica to a strong following of locals and tourists. He doesn’t need to export and only has with an importer in Japan. In the vineyards, he practices organic and biodynamic farming and does all the vineyard work by himself on all eight hectares. That’s a lot to cover for one guy, but seeing how fast he moves and how powerful he is, I thought that if anyone could do it, it would be him. 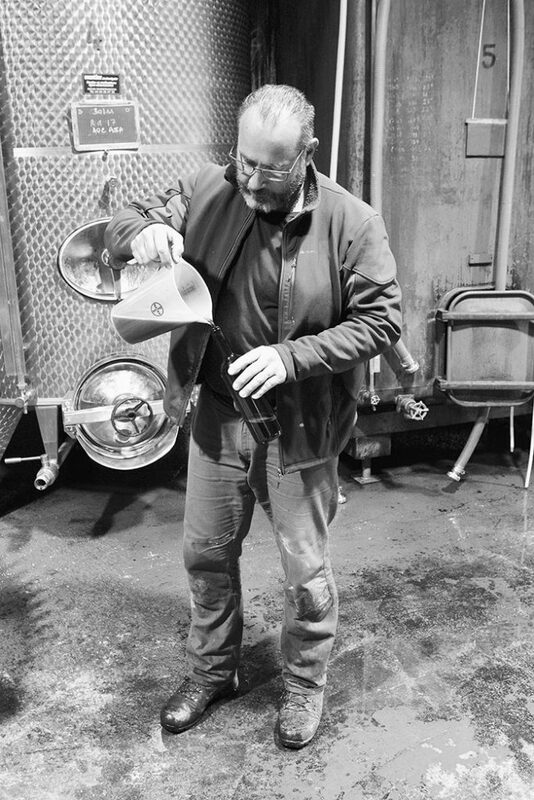 For many years Manu tried to convince Laurent to make more elegant wines, but he didn’t want to change because he believed that his customers wanted bigger wines. Manu said that for years he encouraged Laurent to harvest earlier but he wouldn’t do it. He happened to pick his red grapes early in 2016, which explains why they were so different. In 2017, for the first time, he asked Manu when he should pick. If his 2016 reds are any measure of where he may go he will be one of the most exciting small producers on the island—at least for me. After hearing the story, I asked Manu to call Laurent to find out if he was willing to sell me something. Manu said that Laurent was happy to hear that I liked the wines and that he’d let me take some off his hands—“but not too much.” I was happy to take whatever he’d sell me. As we drove away from Ajaccio, I knew that it wasn’t possible to (nor did I have the illusion that I could) amass a portfolio such as Kermit Lynch with the caliber of great domaines they have from this island. He and his team came to Corsica after decades of doing great business with French and Italian wines, and in a time when the competition got more intense, he blazed a new trail in front of everyone and swallowed most of Corsica’s best whole. It was impressive. Some people lead, some people follow. My resolution was that it should be my work to try to find some of the island’s second-generation of exciting producers and make the investment now. It’s a long game approach and a little like what’s happening in southern Italy and Northwestern Spain for us as well. There are a lot of good producers but not so many unknown great ones. We have to keep our eyes on the future, which is exactly what we’ve done with the majority of our most successful finds throughout our first eight years of importing. Like professional sports scouts, we have to sniff them out when they’re young and before word gets around. I shared my realization with Manu. 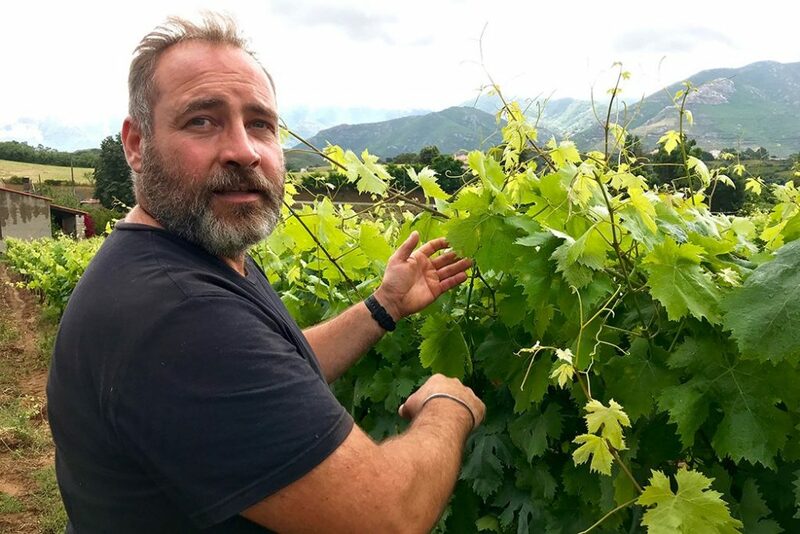 He agreed and said there are few domaines on the island and not many more that will come along that will be very good and still available to import. Manu put the pedal to the metal again as we twisted our way south. We were supposed to have dinner with Jean-Charles, but he rescheduled his meeting with Manu for the next morning at their property; it was a pity because we lost a dinner opportunity at Le Chemin des Vignobles, back in Ajaccio. Once we were in range to call Una Stonda to reserve a table we received the same message as the night before that it was unexpectedly closed. Tough luck for us turned out alright when we found a restaurant that served up some sausages from organically grown veal made by Jean-Charles’ brother Pierre, along with a simple green-leaf salad and pommes frites. We ordered a couple of beers and watched the first half of a football match between Barcelona and Roma. We didn’t have it in us to stick around for the second half, so we went back to our apartment and crashed.